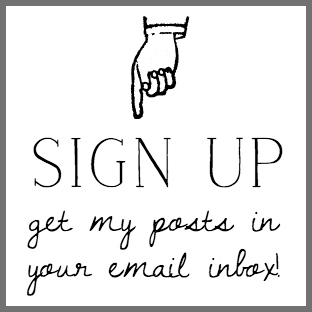 Wow – it’s been a while since I’ve posted! I hope you had a wonderful Thanksgiving with family and friends! Our’s was great! It was just my immediate family with my dad and kids, plus my youngest son’s girlfriend, Rae, was here for ten days from her home in Missouri. It was so fun to have another girl around and I spent as much time as possible getting to know her better and showing her the sights in Lancaster County. We all had a hard time saying goodbye yesterday, especially Seth! Today, it’s back to business and that means “full on” Christmas decorating! I have lots of visions of sugarplums dancing in my head, but very little done – so I’m gonna be a busy girl this week! One space that I did begin to get ready for Christmas is our master bedroom. 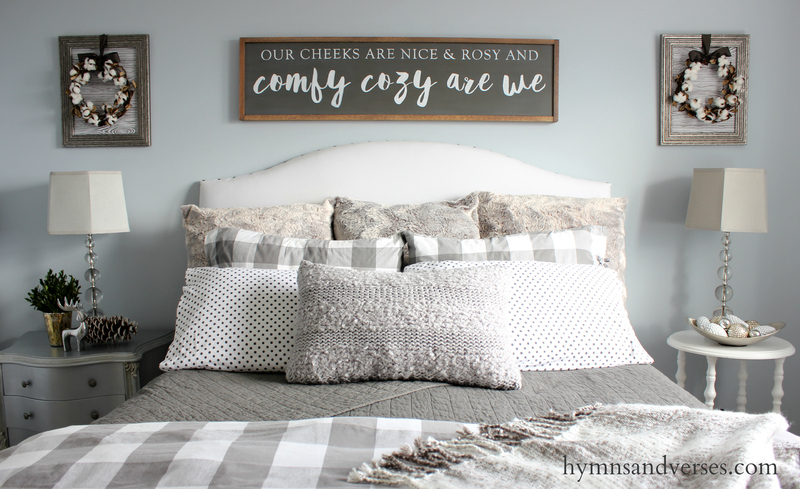 I don’t know about where you live, but there is definitely a chill in the air here in Pennsylvania and when it’s cold outside, we want our bedroom to be comfy and cozy. And, I made a new sign that is for sale in my Etsy shop to hang above our bed from a classic Christmas song – “Sleigh Ride”. What do you think? It has a charcoal gray background with white hand-painted letters and a stained wood frame. I’ll be making these for sale in a limited quantity, so if you are interested, stop by my shop! And, today they will be discounted 25% for Cyber Monday! 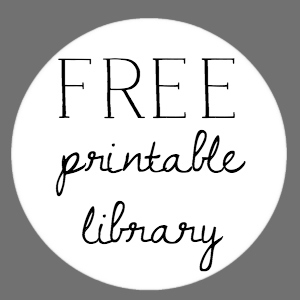 Just enter the code CYBER25 at the Etsy checkout. Now, onto making our bedroom cozy, I made three Euro sham pillow covers from an inexpensive faux fur throw I found at Kmart! Can you believe – three Euro sham size pillows for $15 (I already had the pillow forms). They are so cozy to just lean against to read a book or watch TV. 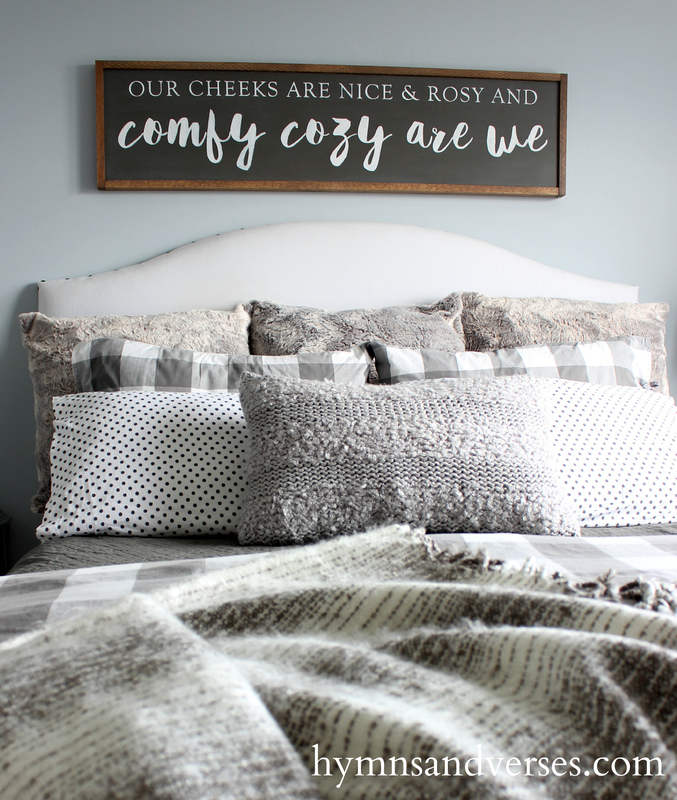 A cozy bed needs A LOT of pillows, so in addition to the three faux fur Euro pillows, I added two queen pillows with gray and white buffalo check shams that came with the buffalo check duvet cover found at Ikea last year. Then, two more standard pillows are covered with white flannel pillow cases with gray polka dots and match the flannel sheets I found at Target. A chunky knit infinity scarf from Ann Taylor Loft a few years ago is transformed into a cozy lumbar pillow! I just slid the scarf over a lumbar pillow form and used gray yarn to hand stitch the two long ends together. Waaa – laaaa! So easy and soooo cozy! 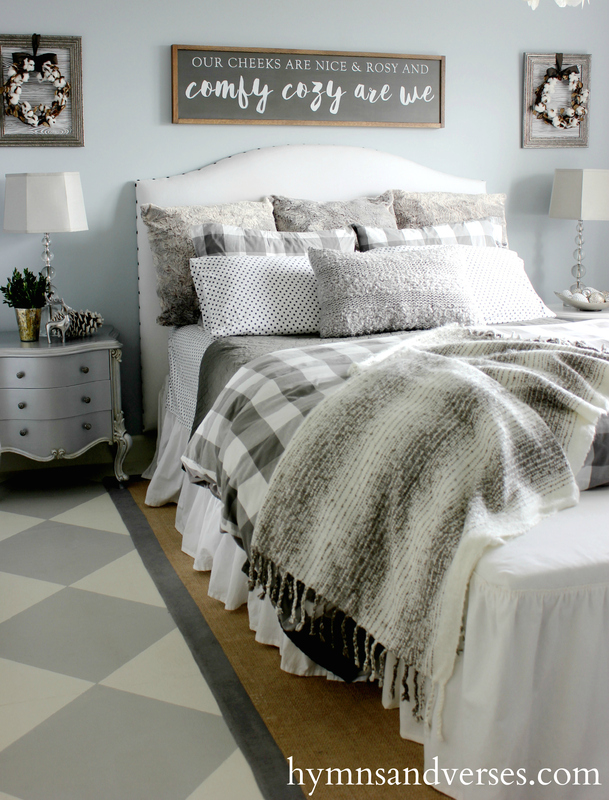 A cozy bed is all about layering! I purchased super soft flannel sheets in white with a gray polka dot at Target. There’s nothing like soft and warm flannel to snuggle in on a cold winter night! Next, is a lightweight charcoal gray quilt that is also from Target. 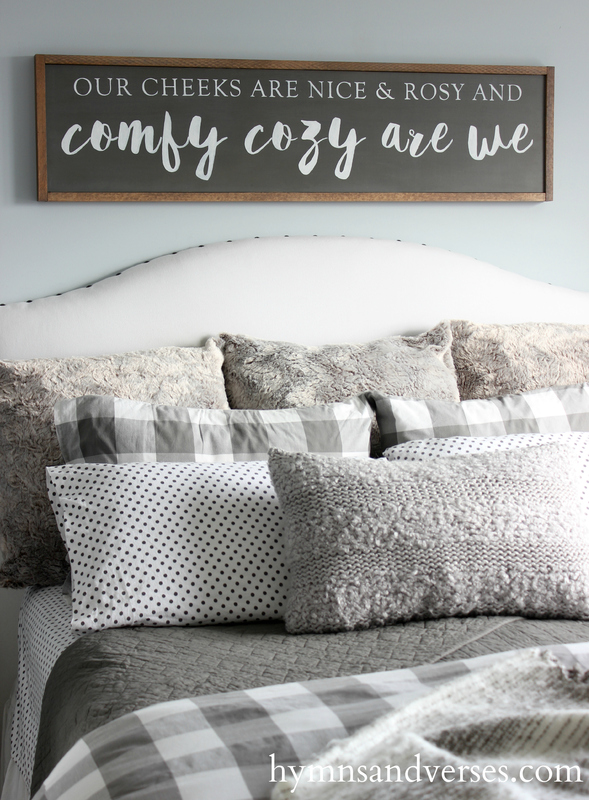 At the foot of the bed, for those super cold nights (or just to keep my toes warm), is our comforter – inside the gray and white buffalo check duvet cover from Ikea. And, lastly, a cozy knit throw is a must for a warm winter’s nap! 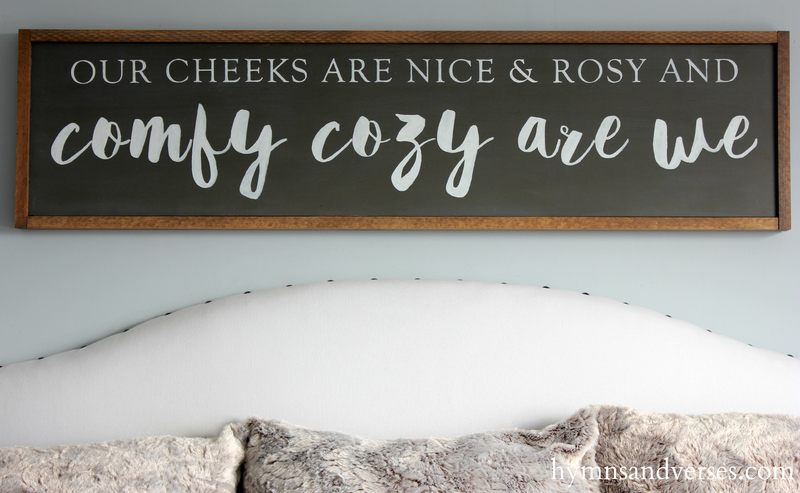 My absolute favorite place to find a cozy throw is at Homegoods, Marshall’s, or TJ Maxx. They always have an amazing selection of quality knit throws (especially this time of year) and you can’t beat their prices! This soft and cozy gray and off white throw was under $20! So, is it cold where you live? Have you done anything to make your bedroom comfy and cozy for the winter ahead? I’d love to hear your ideas! Like I mentioned earlier, I have lots of Christmas decor to come and I’ll be posting more often! 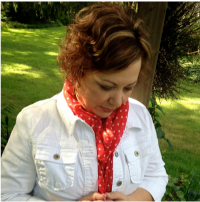 And, next Monday, December 7, I’ll be sharing my Christmas Home Tour! Your sign is great! I never would have thought of buying throws and scarves to make into pillow covers. Great idea! Love the whole room. Hello there! It was really cold today in PA. It was even spitting some snowflakes..small but they were there. I love all of your creations and love looking forward to so much more. I love you comfy cozy saying. So cute. The colors are gorgeous and Those wreaths hanging on frames…adorable! How do you hang those to the back of the frame so the wreaths don’t fall off? Can’t wait to see what you make next. Thanks for sharing. Have a wonderful Happy Holiday! Just beautiful, Doreen. LOVE everything about this room. You always pay attention to the details! Every year I’ve seen changes and updates and style in your decorating that I enjoy getting to take a peek in upon. Your room looks quite toasty warm. I’m cold and it’s California. I have not done my house. But I did slip a pottery barn duvet cover on and pillows and a meet me under the mistletoe pillow? I enjoyed changing out things in our bathroom too. It is fun to have a new look through winter! But I’m most amazed at the shams for $15 out of a throw!!! They really caught my eye first off too!!! Job well done. I love the sign and your bedroom decor! I especially love the look of two different tables on either side of the bed. I am so glad you had such a great Thanksgiving. Love your bedroom…the bed looks so comfy and inviting!! Thanks so much, Jo! Merry Christmas! Love everything about this room! What is the wall color? The color is Benjamin Moore Silver Mist. A pale grayish blue! Love the room!! I have this duvet as well. I love it with the bedskirt. Do you know where it is from? Hi, Nancy! I believe I got the bedskirt from HomeGoods.